Winter, for sure, is my favorite season. I like cold weather. It might be easy for me to say this now, as I live in a place where cold weather generally means overnight lows in the fairly high 50’s. There is no snow, except way up in the mountains, so there are no walks to shovel. We don’t need to salt our roads or need tire chains to drive around. The palm trees that line the streets near the beach are still green and though the ocean water may be a little on the cool side, it doesn’t stop the surfers from catching waves almost every day. So, for us, winter is easy to like. Some people tell me that I might not like winter if I lived where it snowed and I have to say, I have lived in both New York and Anchorage, so I know the perils of “real” winters. I know what it’s like to have to scrape your windshield to remove the snow and ice before you can drive, assuming the snow plow didn’t bury your car in the first place and I know what it’s like to have icicles form on your nose as you breathe. I would still pick winter over any other season as my favorite. Winter has those long nights, the holidays and all the decorations that come with it. It has eggnog, hot cocoa, and hot buttered rum (if that’s your thing). It has fires in fireplaces and warm cozy blankets as well as skiing, sledding, ice skating, and let’s not forget curling. Plus around here specifically, when the temperature drops and the nights get a little cold, Riley jumps up on the bed, at some point in the middle of the night, and that helps keep my feet warm. While living in Alaska, David and would often head out to the Park Strip where in the winter the basketball courts would have been flooded to make ice skating rinks. We would spend a few hours out there going around in circles trying not to fall or look like fools, neither of which were successful for me. For the life of me I can’t cross my feet when I skate, so cornering was a little rough. In fact, there is no way I can actually have one foot off the ground for more than a second or two, so I sort of just shuffle along. That being said you can gain a fair amount of speed by shuffling and after a while you find a rhythm that keeps you going. We would usually wear earmuff headphones too which were attached to Walkman’s on our belts, which helped with the illusion that you’re skating better than you actually are. One night I had a pretty good skate going, had a good rhythm, was making pretty good (decent) turns, and the music in my ears was loud and very dramatic (I think it was Tina Turner’s - We Don’t Need Another Hero). Towards the end of the song when the music swells I raised my arms as if I was going to attempt a triple lutz, double axel, backwards camel sit spin, sal chow jump when without any warning my skate hit a dime that had been dropped on the ice and I was down, with a very heavy thud, sliding face first across the ice, headphones going one way and the Walkman going another. This was how it was, one second you’re doing great, the judges are giving you perfect 10’s (except the judge on the end who always gives you a two) and the next second the ground is gone, your arms and legs are flailing about, and you’re free falling towards the ice due to some pebble, or other debris embedded therein. Of course, when this happens all I can do was wait there, sprawled out on the ice for David to skate over and help pick me up, all the while hoping there was nobody walking by to see me fall. Thank goodness YouTube had not been invented yet, that’s all I can say about that. Besides winter activities, the cold weather brings with it one of my favorite types of food… Soup. I think soup is actually perfect year round but there is something about a cold winter day and a nice hot bowl of soup that really makes me happy. Pair that soup with a sandwich and I’m over the moon. For a long time though (too long) the only soup I ate was premade soup from a can. I think this was because they were quick to heat up and especially when you had store coupons they were relatively cheap. For a while, every time we went grocery shopping we would stock up on soup. Canned soup became sort of a habit, it was easy and it was the perfect serving size, no leftovers to worry about, very little clean up, and back when we had a microwave it was ready in mere minutes. So, when we wanted an easy meal, and we wanted it in a hurry we felt that there was nothing particularly wrong with canned soup. My favorites were split pea with ham and New England clam chowder and David usually chose soups that were more meat and vegetable style like chicken noodle, or beef and barley. Though I will admit that bean and bacon soup and a peanut butter and jelly sandwich got me through many, many, nights during my first few years away from home. There was however, one soup we both avoided like the plague and that was tomato soup. For me the thought of eating tomato soup was just repulsive. I didn’t like tomato juice so why on earth would I like it heated up and called soup? I don’t remember the first time I had tomato soup but I can remember that it tasted like tin, the odor was not that of a tomato, and the texture was thin and watery. This put me off almost any tomato-based soups, even Manhattan Style clam chowder was off the list. David’s experience with tomato soup was far worse than mine though. As a child, after returning from the hospital after having an emergency appendectomy, David’s mom made him a bowl of canned tomato soup. This ended badly… just think about The Exorcist but it wasn’t green. Nuf said. So anyway, needless to say, for a long time, we felt that if tomato soup was the only soup available to eat, we would swear off soup for the rest of our days. But then something good happened… I started to make our own soups. I stopped buying canned soups and instead opted to make my own minestrone soup, my own pasta fagioli, my own vegetable soup and I even bought a “soup only” cookbook for more ideas. And you know what? They tasted better. Suddenly they had body and flavor unlike any of those canned soups. The pieces of chicken in my chicken noodle soup were big, the noodles were not mushy, and you could taste the vegetables that flavored the broth. It was like a whole new world. I would insert a clip of Aladdin and Jasmine singing while they fly around Agrabah on a magic carpet here, but I don’t want to deal with the copyright issues that may arise… you can sing it in your own head though if you like. Anyway, one day I was watching the Barefoot Contessa show and she is making tomato soup. It seems pretty easy to me, it seems like it’s not anything like that watery, tinny, soup I had so long ago, and it seems like I should be fair and give it another try. Here is a link to her original recipe. So off to the market I went for the ingredients. I will admit there was some trepidation on my part so I also picked up some good bread and some good cheeses so that even if the soup was a bust I could eat grilled cheese sandwiches and the whole thing wouldn’t be a total loss. Here’s the best part… it was fantastic! That soup had an exquisite flavor and such a great texture that I almost (I said almost) forgot I had grilled cheese sandwiches on the side. 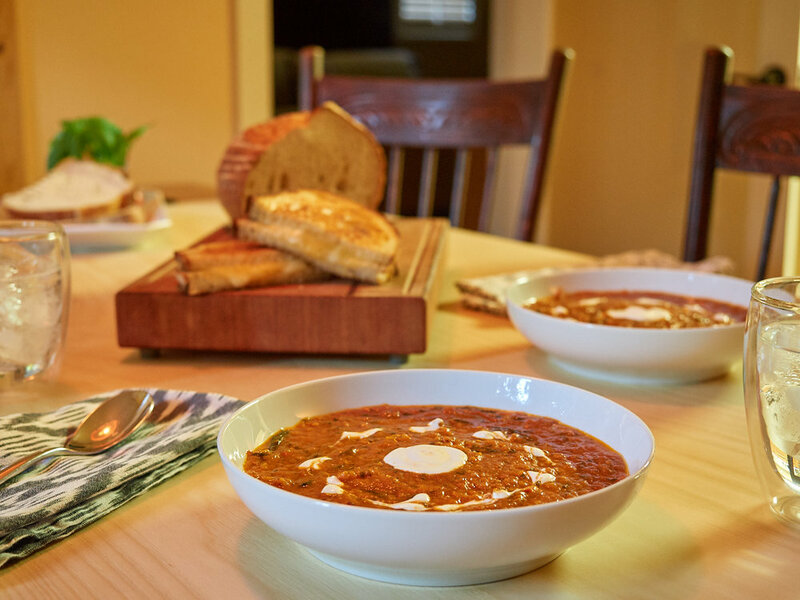 While somewhere in the recesses of my mind I have always known that making anything from fresh ingredients is going to beat out almost any canned or frozen product you can buy, I think I wasn’t prepared for just how different this soup actually was. 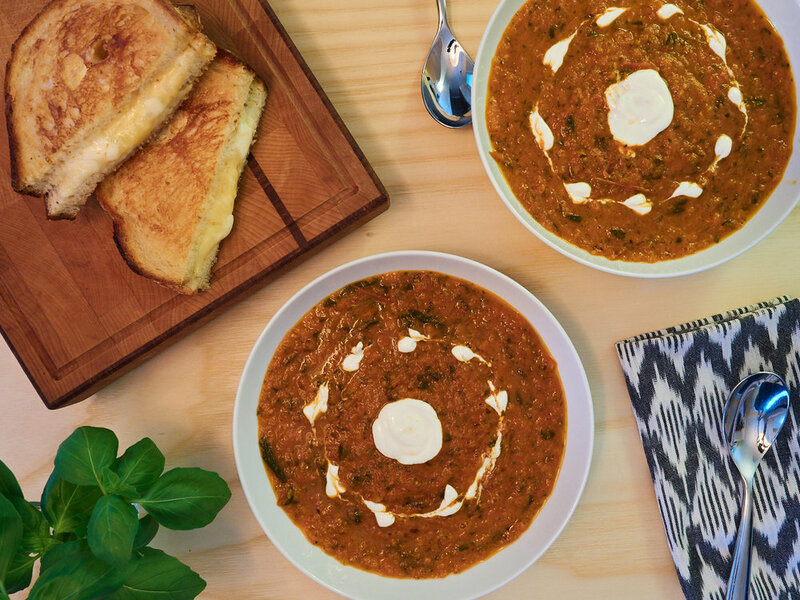 If you like tomato soup, I think you’ll really like this version. It’s super simple to make and you know that’s a plus in my book. Now, I am not one of those people who would ever tell you that you should try something before you say you don’t like it. If you don’t want to try oysters (for example) then don’t, if you don’t like tomato soup, then you can skip this post and make something else instead. You won’t hurt my feelings (at least I won’t admit to that) but if you think you might like to try it again, or try it for the first time, I suggest you start with this recipe… and don’t forget the grilled cheese sandwiches on the side. Before we get to it, you’re going to need just a few things that I bet you already have. First you need a large stockpot to cook everything in as well as a sheet pan to roast the tomatoes on. You’ll need a blender to finish the soup as well (if you have a food mill use that with the coarsest blade, otherwise a blender will do). And, here are just a few notes to keep in mind. When buying the canned tomatoes see if you can find San Marzano tomatoes. Yes, they are a little more expensive but there is a difference in quality and taste. Also, the recipe calls for a quart of chicken stock, but you can substitute vegetable stock or plain water for a completely vegetarian option. Begin by preheating your oven to 400°F with the rack in the center position. 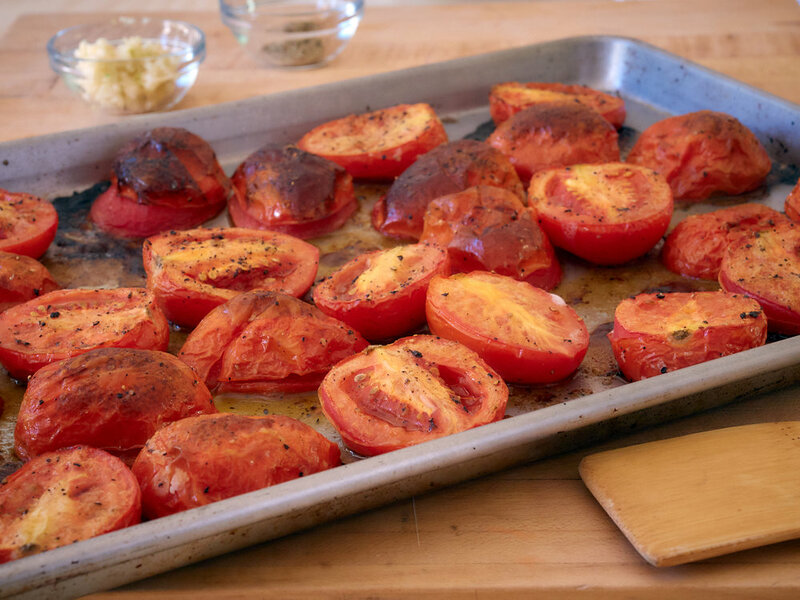 Spread the tomatoes in a single layer on a baking sheet and roast them for 45 minutes. Set a large stockpot over medium heat and add the remaining 2 tablespoons of olive oil and the butter to the pot. Add the onions, the garlic and the red pepper flakes and sauté for about ten minutes or until the onions have softened, and started to brown. Next, add the canned tomatoes, the basil, the thyme, and the chicken stock to the pot and give it a good stir. Finally, add in the oven-roasted tomatoes, including any liquid that is on the baking sheet. Bring the soup to a boil, then adjust the heat as needed to keep the soup at a simmer for 40 minutes, uncovered, and give it an occasional stir. The last step is to process the soup in a blender just long enough to break up any big chunks of tomato. You do not want to completely puree the soup (unless you like it that way), it should still have a little texture. If your blender is small, process the soup in small batches rather than all at once. Alternately if you have a food mill you can pass the soup through that, fitted with the coarsest blade. Taste for seasonings, adjusting as you like and you’re ready to serve. 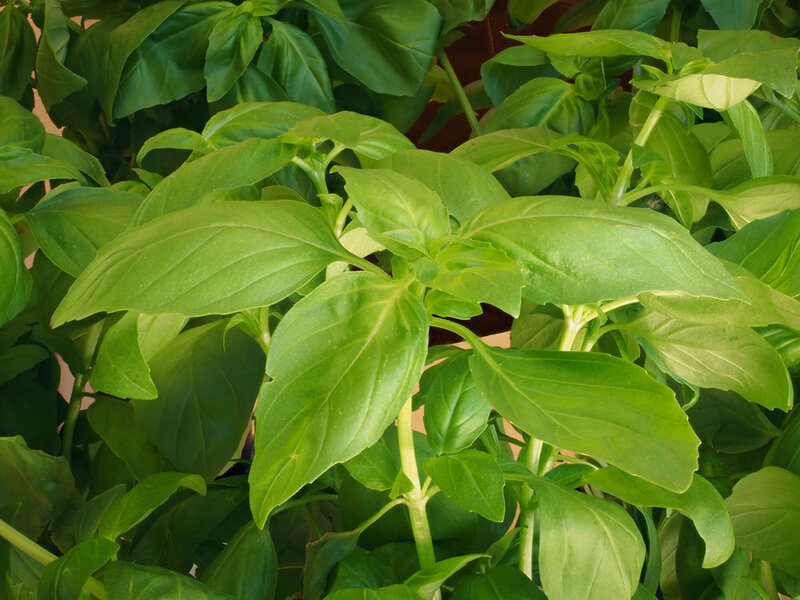 You can garnish the soup with a basil leave or two and some sour cream, crème fresh, or even a dollop of yogurt. I like mine with a little grated Parmesan cheese sometimes as well. 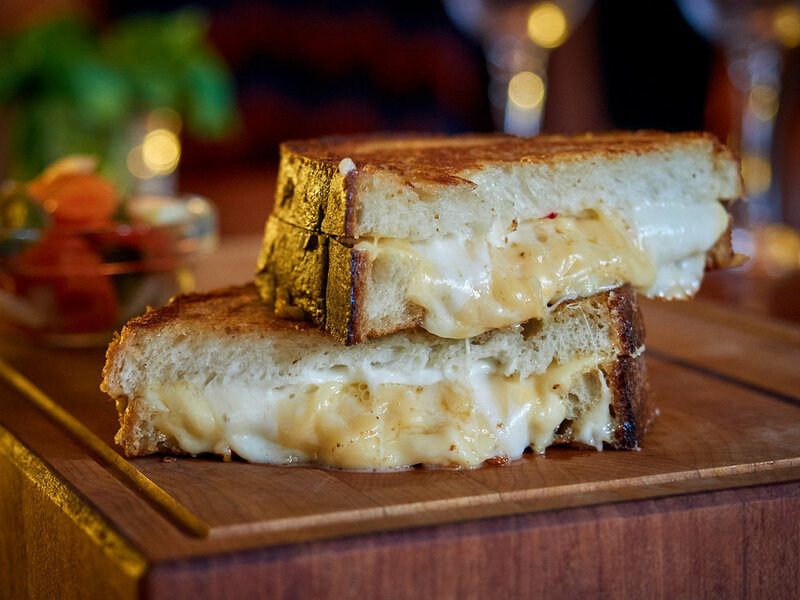 And of course you made grilled cheese sandwiches too, didn’t you… Didn’t you? Riley is pretty sure he doesn’t like tomato soup… and wonders why we even gave him this empty bowl.